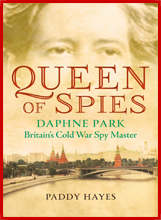 Queen of Spies is the life story of an outstanding woman, the British Cold War spy Daphne Park. Her story would be extraordinary in any era but in the context of the times she lived through, it is almost beyond imagining. Born into penury in 1921 Daphne Park went from living in a tin-roofed shack, 500 miles up-country from Dar-es-Salem, to becoming, in 1990, Baroness Park of Monmouth. She went from being semi-literate, studying on a plank balanced on two empty kerosene cans, to graduating from Oxford University with an honours degree to being invited back 37 years later to become the Principal of her Oxford college. She went from being a humble FANY in 1943 to being made an Area Controller of the Secret Intelligence Service (MI6/SIS) in 1975. To achieve any of the three would seem like a life fulfilled, ambition satisfied. But to achieve all three speaks of an extraordinary ability, inner strength, determination and certainty of purpose. When so much of her life took place against the backdrop of the Cold War and of Britain's slow and often painful disengagement from Empire, it makes for a compelling story, a life well worthy of a biography. As a former SIS Chief, on being apprised of my intention to produce such, remarked; "Good, Daphne deserves a decent book." A new book by author Paddy Hayes lifts the lid on some of the hidden aspects of the life of Daphne Park (1921-2010), who was born in Surrey and became arguably one of Britain's most successful female spies in the post-1945 period. Entitled Queen of Spies: Daphne Park, Britain's Cold War spy master, the new book is part biography and part history of the role of women in espionage during both the Second World War and the Cold War, a topic in gender history that still remains relatively under-researched by scholars. I met Daphne PARK in the mid-1990s. With the ending of the Cold War it was decided by HMG that the Secret Intelligence Service (SIS/MI6) should be placed on a statutory footing. Human Rights legislation, employment law and civil society generally were combining to make the continuation of its 'does not officially exist' status untenable. As part of this process (called 'avowal') Daphne Park was permitted to provide an interview for the BBC's Panorama programme on the work that SIS did. It was a heavily censored account but was still a first. I had been aware of her existence for some time, she had become 'known', mainly from her role in the overthrow of the Lumumba administration in the newly independent (Belgian) Congo in 1961 (described in detail in the book). Through a mutual friend, the Lord Tordoff (she was a Peer by then) I got in touch with her and arranged to meet. I found her to be tough minded, quite combative, steadfast in her distrust of the Russians and totally fascinating. We did not stay in touch, she was too careful for that but I followed her though the occasional interview she gave to selected journalists; the Daily Telegraph was one, The Times another, she was interviewed by Woman's Hour on BBC Radio 4 and by Alan Judd (a former SIS colleague, true name Alan Petty) for an address she gave to the Royal Society of Literature. All helped to build the picture. Daphne Park passed away in 2010. Two years later I decided to write her biography and commenced my detailed research. I had some information on file (from the above sources) and to this was added quite a bit from obituaries written by former colleagues and a detailed memorial tribute given by Sir Gerry Warner, an old friend and former Deputy-Chief of her Service. The culmination is Queen of Spies. For the book I interviewed some 20 of her former SIS colleagues, most on conditions of anonymity but those who can be named include the (late) Hugo Herbert-Jones CMG and Brian Stewart CMG, recently deceased. Julian Harston, Hugh Bicheno and her former No2 in Leopoldville, John de St Jorre.